Strong, reliable and reusable totes. Ideal for storage, distribution and order picking. Tops are permanently attached with steel hinges that interlock securely for stacking strength. Stack for maximized storage and nest when empty. Textured, non-slip bottom ensures smooth conveying. Ergonomically designed handles allow for easy lifting. 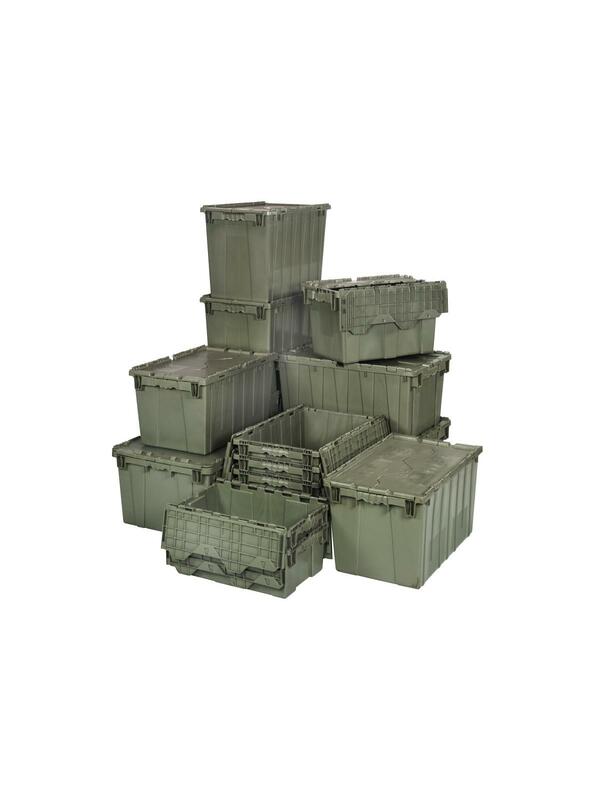 Recessed lids ensure maximum load stability. Padlock eye provides security option allowing lids to be fastened and/or locked. 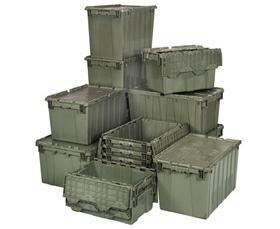 Molded from high density, FDA approved polyethylene. Lids close securely to protect parts from dust or damage. Distribution container has an optional 3" x 5" adhesive clear label holder which attaches securely for easy part identification (see Related Items tab). FOB Shipping Point. L x W 20 x 11-1/2" 21-1/2 x 15-1/4" 22-1/8 x 12-13/16" 24 x 15" 24 x 20" 27 x 17-3/4" 28 x 20-5/8"
L x W 18 x 10" 19 x 10-7/8" 19-1/4 x 13-1/4" 21-1/4 x 12-3/4" 21-1/4 x 17-1/4" 24-1/4 x 16-3/4" 25-7/8 x 18-3/4"
L x W 17 x 9-3/4" 18-1/2 x 10-5/8" 19 x 13" 20-3/4 x 12-1/4" 21 x 17" 24 x 14-1/2" 25 x 18"
Height 11-7/8" 12-1/2" 12-3/4" 13-3/4" 15-5/8" 17-1/4" 7-1/2" 9-5/8"